A beautiful little creek runs along the northern boundary of our family property, Pilyara. Beyond it lies Bunyip State Park, a forest in the southern foothills of the Great Dividing Range. Land either side of our creek is virgin country, too steep to bother with when the area was originally cleared for timber and grazing. It has always been a shady haven for ancient tree ferns and delicate ground orchids, all flourishing beneath a soaring canopy of messmate and mountain ash. Pilyara’s bottom paddocks run down to this creek. There’s never been a fence. Steep, thickly timbered slopes have generally acted as a safe barrier for stock, although for years we regularly lost our colossal pet bullock, Toro, to the neighbours. My son often walked the friendly beast home with just a rope around his neck. Many times I’d toyed with the idea of fencing along the creek, but there was a problem. What about the black-tailed wallabies? What about the forester kangaroos? What about the fat wombats, that emerged from their gully warrens and lumbered uphill each night to graze the moonlit paddocks? Fencing Toro in, would mean fencing them out – and after all, they were here first. Braving the weather, I walked down the hill and tried to track the vanished herd. Sure enough, they’d moved out along the creek. What a mess! The banks were broken, caved into the water, taking great swathes of vegetation with them. A once pristine environment was little more than a wallow, flowing sluggish and muddy past trampled reeds and pugged up pools. Pity the poor platypus. The damage was plain as the nose on your face. Until then I’d been a cautious supporter of alpine grazing. It reduced bush fires, didn’t it? In 2009 my family had spent days watching a monster fire lurk in the forest to our north. On Black Saturday, a capricious wind change saved us, but doomed many others. If grazing really reduced fires, I’d still be for it. A ton of research later, and I got my answer. Both the extensive Esplin Report (following the 2003 alpine bushfires) and the recent combined CSIRO, LaTrobe University and NSW Department of Environment and Conservation study found that cattle grazing had no influence on the spread of fire. I’ve since joined the Environmental Farmers Network. It supports rural ecological programs, and acknowledges farmers as front-line stewards of the land. Our farmers fence off creeks. They replant and reseed with locally indigenous trees and restore degraded river banks. They build wombat gates, preserve stag trees and put fish ladders in dammed streams. They work hard to give nature a helping hand. We’ve just received a Healthy Waterways grant to build a wildlife-friendly fence along our creek frontage (Yay!). Healthy rivers, creeks and wetlands are the arteries of our landscape … the life blood of the bush. State and Federal Governments encourage such programs as best practice. Why should management of our precious alpine regions be any different? Look at the Bunyip State Park management plan and you find the seven grazing licences in the southern section of the park are not transferable, and no new licences will be granted. This is because cattle spread weeds, and damage native plants, wetlands and waterways. It’s true for the Bunyip forest and it’s true for the alps as well. Our magnificent high country is celebrated in Australian art and literature (Including in my own 2012 novel Brumby’s Run).The mythical beauty of Man From Snowy River territory forms part of our national psyche. Romantic images of red and white cattle, stringing between the snow gums, feed into this notion. But the unfortunate truth is, cattle damage fragile landscapes, and there are plenty of forward-thinking farmers who understand this. 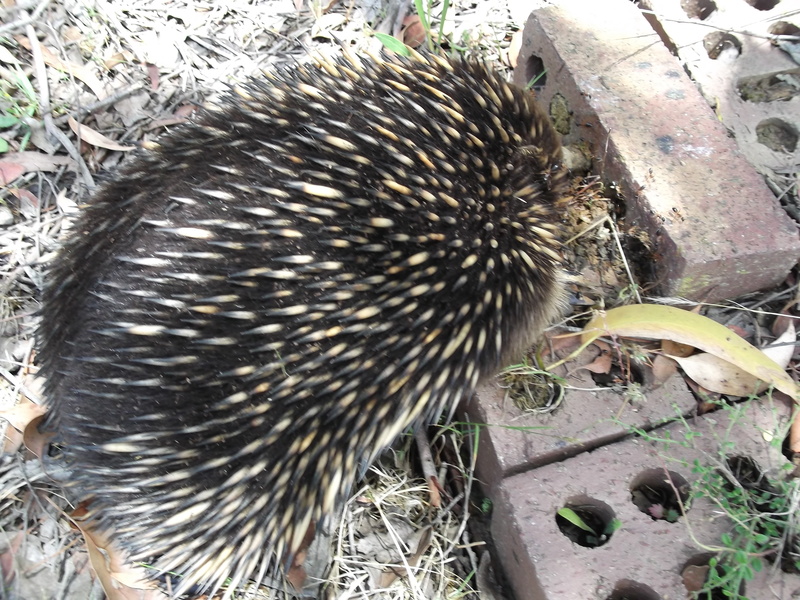 Millie, a friendly echidna, has recently arrived at Pilyara. (I really don’t know what gender, but with such a pretty face, I’m guessing a girl!) She loves feasting on the meat ants that live in our old brick pile. So in honour of our new resident, here are some fascinating echidna facts. 1. 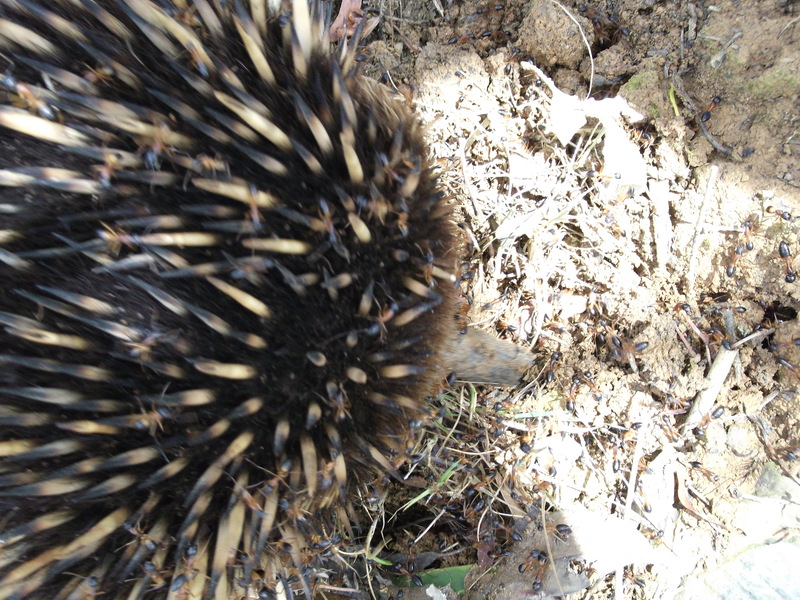 Echidnas are the most widely distributed mammal in Australia and are listed as common. (Yes – I know they’re monotremes too.) But because they live for forty-five years or more, we may have an ageing population. Nobody knows the current survival rate for young. In a Kangaroo Island study, more than a quarter of all puggles (the cute name for baby echidnas) were killed in their burrows by cats each year. 2. The prefrontal cortex of an echidna’s brain is larger compared to the rest of its body than any other mammal, including man! Usually the greater the volume of this part of the brain, the more intelligent the animal is. So, Millie’s a smart cookie! 3. It was once thought that echidnas were the only mammals that didn’t dream, because they didn’t seem to experience REM sleep. It’s now been discovered that echidnas do experience REM sleep, so long as they’re at the right temperature. At 25°C they experience REM sleep, but at 28°C or 15°C it decreased or disappeared. Wonder what they dream about? 4. 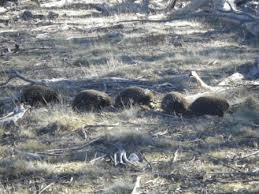 Echidnas breed in winter, so if Millie sticks around until then, I might be lucky enough to see some fascinating courtship behaviour – an echidna love train. These processions are led by the female, with up to ten lovelorn males trailing behind. It can take six weeks before Miss Popularity chooses a mate from the strongest and most determined suitors. I finished my edits for Currawong Creek (June release) this week, and was too busy for my usual Sunday post. So here it is, better late than never! 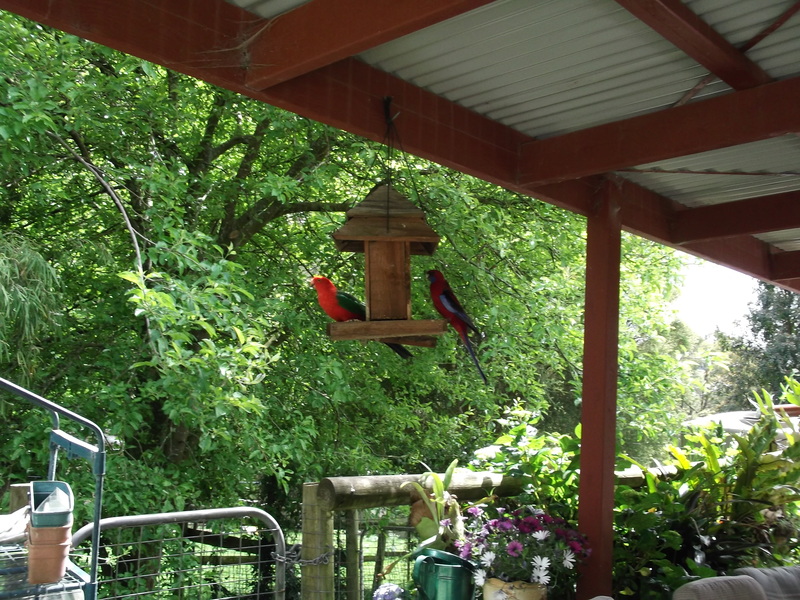 We have a wide variety of beautiful parrots here at Pilyara: Rainbow Lorikeets, Eastern Rosellas, Crimson Rosellas, King Parrots, Galahs, Little Corellas, Sulphur Crested Cockatoos, Yellow-Tailed Black Cockatoos, Gang-Gang Cockatoos and even the occasional Long-Billed Corella. These are the usual suspects. 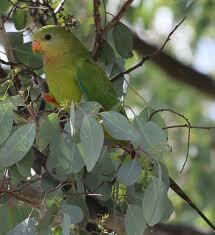 So I was very surprised at the arrival of a green parrot which I’d never seen here before. I identified her as a Superb Parrot hen. After a bit of research, I discovered this parrot lives in New South Wales and northern Victoria, on the inland slopes of the Great Divide and along adjacent river systems. In other words, she does not belong in the southern Victorian ranges. The parrot (who we promptly dubbed Kermit), was quite tame and on closer inspection, a band could be seen on her leg. Kermit was an escapee from captivity. I wish she could tell me her story! After much ringing around, I got onto a lady from the Bayles Fauna Park. She convinced me that I should catch Kermit and take her to the park, as a domesticated bird would not last long in the wild. I managed this without too much trouble, and Kermit now lives in a spacious aviary with others of her kind. While researching what to do about our unusual visitor, I came across a remarkable organisation called the Parrot Rescue Centre. It is dedicated to improving the lives of suffering, abused and unwanted pet parrots by providing an appropriate environment for their individual needs. Its main aim is to educate people about the correct diet, housing, enrichment and training of these highly intelligent and long-lived birds. It also runs a rescue and adoption program, as well as a lost and found service. 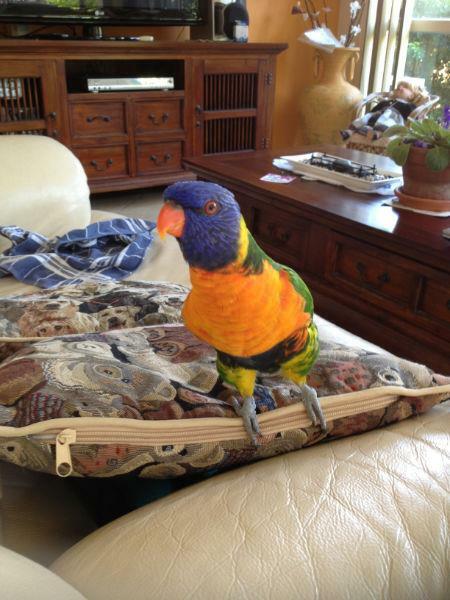 It is fascinating to browse their website, and see the gorgeous birds available for rehoming, such as this lorikeet. Why don’t you go and like their Facebook page, or even give them a donation? They are an inspiration! Well, Christmas is over for another year. I’m always surprised by how enthusiastic I get about the day. We are fortunate here at Pilyara that we don’t have to go anywhere. The family comes to us. It means I prepare most of the food, but the trade-off is that we don’t have to pack up the car and drive for miles. My daughter H made a stunning assortment of Christmas cookies – real works of art. Here’s the very simple recipe for Christmas Truffles. They really are to die for! Place the cake in the bowl of a food processor and process until finely chopped. Transfer to a large bowl. Stir in the dark chocolate, brandy and jam. Place in the fridge for 30 minutes or until slightly firm. Line 2 large baking trays with non-stick baking paper. Stir the cake mixture. Roll 2-teaspoonful quantities of cake mixture into balls and place on the lined trays. Place in the fridge for 1 hour or until firm. Place the extra dark chocolate and copha in a medium microwave-safe bowl. Cook on High/800watts/100% for 30 seconds. Stir. Repeat until chocolate melts and the mixture is smooth. Line 2 baking trays with non-stick baking paper. Use a truffle dipper or fork to dip 1 truffle in the chocolate mixture to coat. Remove truffle, tapping the dipper or fork on the side of the bowl to shake off excess chocolate. Place on 1 lined tray. Repeat with remaining truffles and chocolate mixture. Set aside to set. Spoon the white chocolate into a small sealable plastic bag. Cut 1 corner from the bag to make a small hole. Drizzle a little white chocolate over each truffle. Top with glace cherry (or, in my case, sprinkles) to decorate. Set aside until set. My son M on the other hand, was in charge of the cheese platter. Not to be outdone, he made a fortress of cheese cubes with turrets of crackers, mortared together with hummous. An interesting creation! The day was one of fun and family; a fantastic conclusion to an exciting year. Thank you to everyone who has supported me and my writing in 2012. I couldn’t have done it without you, and look forward to the continuing journey. Wishing you all a very happy, peaceful and productive New Year! One of the joys of living surrounded by bushland is the never ending variety of life that passes by, season by season. In spring, the wildflowers and birds provide spectacular flashes of colour. Here at Pilyara the soil lacks some of the richness found elsewhere, and this is the situation favoured by many ground orchids, or rather they have adapted well to such soils. 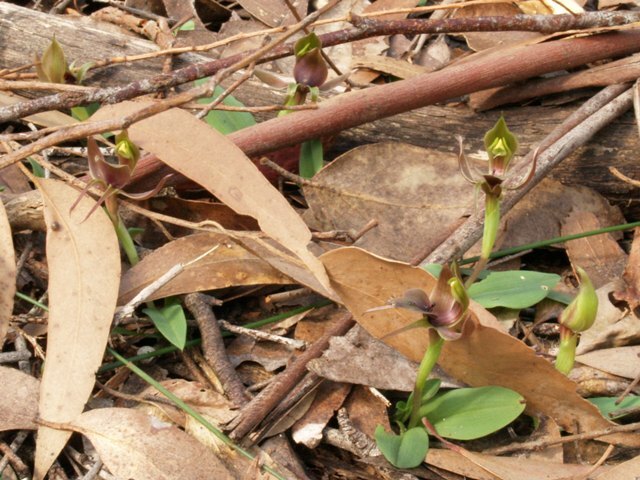 Under the canopy of Messmate, small colonies of orchids can be found. Several species have begun to flower, and more will follow in the weeks to come. 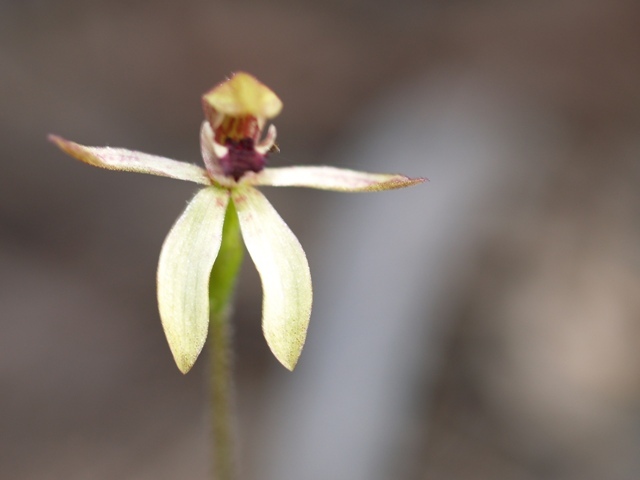 Many Australian orchids depend on mimicry to attract pollinators, using pheromones similar to those given off by female wasps. These orchids generally have unspectacular flowers, although in an attempt to appear wasplike their forms can be remarkable.Those that attempt to attract pollinators using colour and perfume are more spectacular. The most showy varieties at Pilyara are the sun-orchids, so called because their flowers only open on warm sunny days. 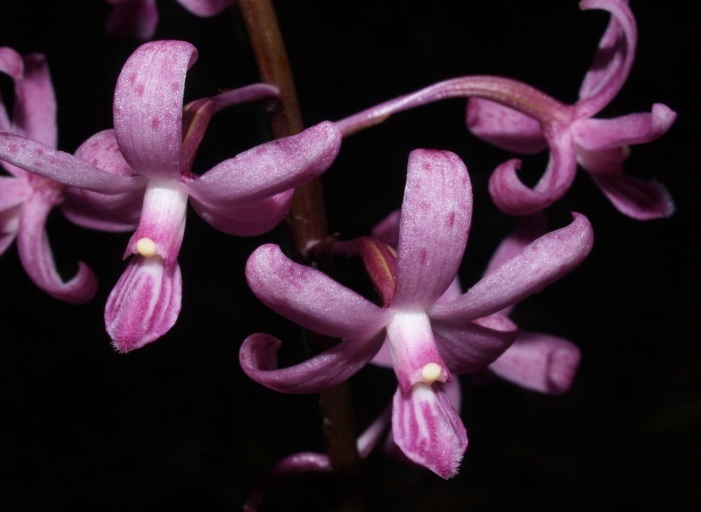 The profusion of orchids found at Pilyara is not rare, or even uncommon. I’m still waiting to find something really unusual hiding away. But as more and more bushland disappears, the rare vanishes, the uncommon becomes rare, and the ordinary takes its place as vulnerable. What a responsibility we have as stewards of this earth! 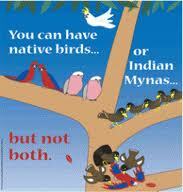 Indian Mynas are one of the most invasive animal species in the world. Introduced into Australia in the late 1860s to control insects in market gardens, they have now spread to most of coastal Australia and New Zealand. Mynas are a serious environmental threat to native wildlife, taking over nesting hollows, evicting birds and small mammals, and preying on nestlings. I admire these adaptable little birds, I really do. Their success is testament to their intelligence and devotion to their young. They are also great songbirds and mimics. 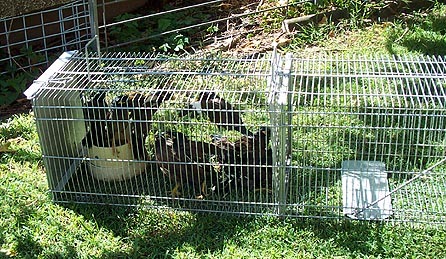 Nevertheless, I am a member of a landcare group that routinely destroys these birds. I have personally trapped sixty six mynas at Pilyara in just three years, handing them over to be euthanased. This makes me very sad. Each time a group is consigned to be gassed, I say a little prayer and apologise to them. After all, this isn’t their fault. We brought them here.They are innocent, just surviving – doing what mynas do, and making a pretty fair fist of it. And that, of course, is the problem. For one myna becomes ten in just three years. That means my sixty six birds would have become six hundred and sixty by now. Local wildlife could never cope with such an onslaught. So I continue my involvement with the program, and monitor the skies for mynas. I just never forget who the true culprits are. 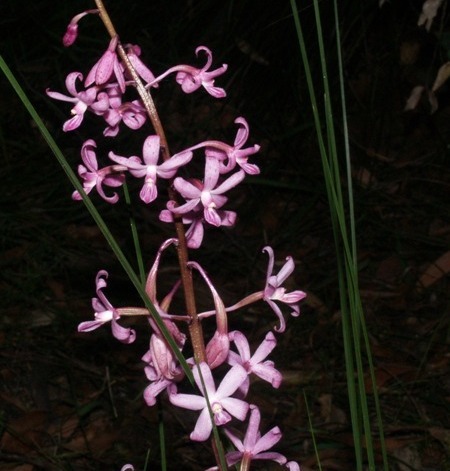 Tall spikes of Pink Hyacinth Orchid (Dipodium roseum) are blooming all over Pilyara’s shady messmate gullies at this time of year. It is by far the most spectacular and abundant ground orchid on the property. As a Saprophyte, it has no leaves or green colour at all, hence no way to photosynthesise. Each stout reddish brown stem bears a spike of up to fifty delicate pink flowers, that resemble Hyacinths. 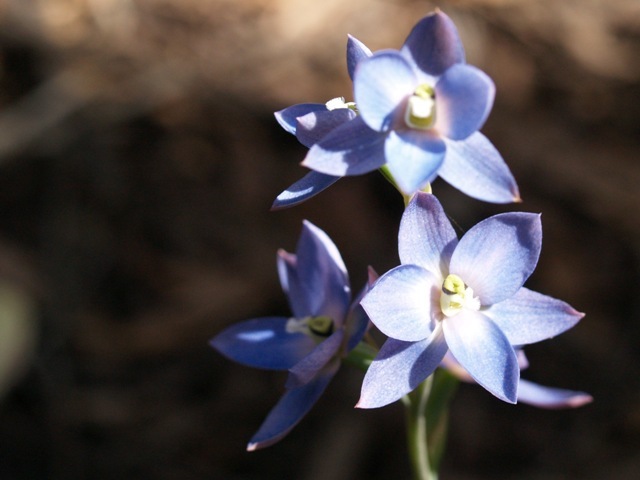 The Hyacinth Orchid relies on mycorrhizal fungi growing in association with eucalyptus tree roots to provide it with all the nutrients it needs. The plant reverts to dormancy as an underground tuber in late summer, when its life-cycle is complete. Seed capsules are sometimes produced and can be seen for several more months. I am always fascinated by these sorts of symbiotic relationships. They demonstrate the vital, but often invisible interconnectedness of living things in our world. Any foolish person who tried to grow this showy orchid in their home garden would inevitably fail. It can only live in association with its specific fungus, and therefore cannot be cultivated. 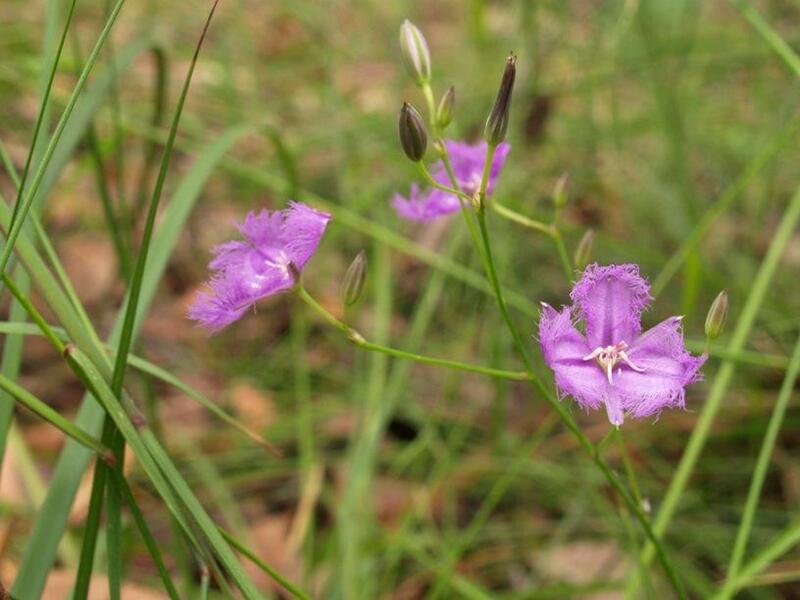 Common Fringe Lilies (thysonatus tuberosus) are flowering now at the edges of Pilyara’s shady messmate gullies. Their botanical name tuberosus comes from their edible root. These lilies should be given a new everyday name though, as there is nothing common about them. They are wildflowers of exquisite charm. Fringe Lilies grow on low stalks, that bear a few slender, basal leaves. The flowers appear at the end of short branchlets. Each purple petal is edged with a delicate, feathery fringe, highlighting the bloom with a halo effect. In between each petal is a sepal of deeper mauve, like a narrow satin ribbon. Their perfection is ephemeral – each flower lasts just one day. So lovely, yet so fleeting. The plant itself flowers for several weeks though, so there is plenty of time to catch the beauty of a new bloom. 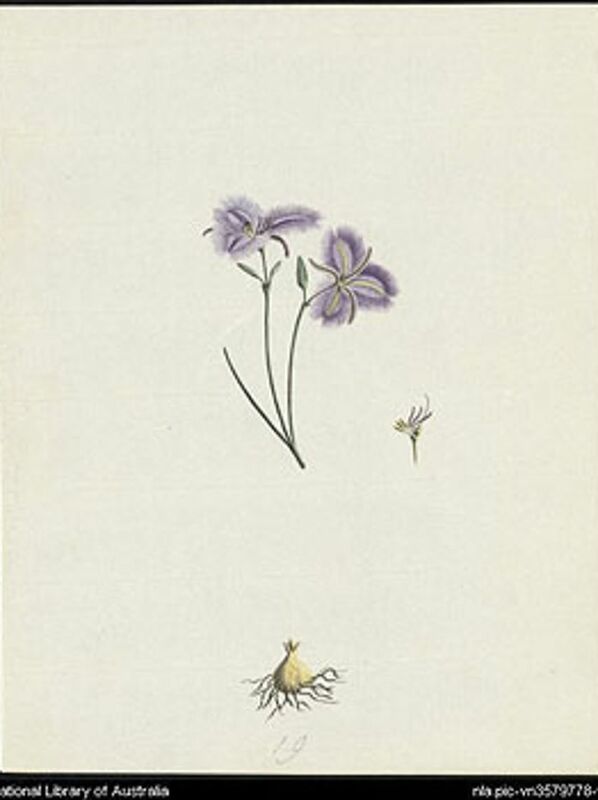 This watercolour painting of a Fringe Lily is part of the Ducie Collection of First Fleet Art. The artist’s name is George Raper. 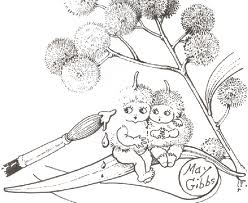 He was a naval officer and talented illustrator. Unfortunately he was only twenty eight years old when he died. 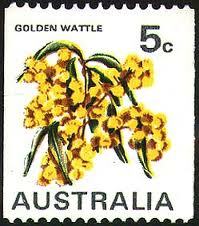 (1769-1797) The image is courtesy of The National Library of Australia. 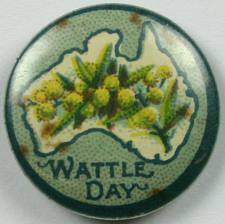 It proves this lovely little lily was one of the very first native flowers to attract international acclaim. How fortunate am I to be able to see them flowering in the wild, just metres from my house!